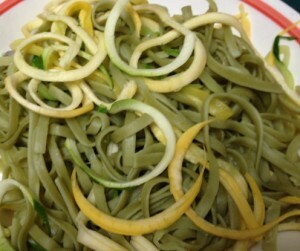 Add Zucchini Noodles to Your Pasta! This low calorie, easy, vegetarian recipe just came together because of a new gadget I found. It is so much fun to use that I’m already checking the fridge for something else to try it on. The new toy is the GEFU Spiral slicer, but more about that below. This is about the recipe. Basically, I spiral-sliced one zucchini and one yellow crookneck squash. The spirals came out looking like spaghetti. First I combined them with spinach fettuccine, adding them to the pot for the last couple of minute of cooking time. Then simply serve with your favorite pasta sauce. I used a marinara sauce, and was delighted with the finished dish. It is so tasty. The serving pictured about used only two ounces of the pasta (that’s just 210 calories) and one cup of the squash spirals. It’s very low in calories for a very big serving. Use your favorite meat sauce too, if you aren’t a vegetarian. Next time I’ll add onions slices and some mushrooms too. I loved the fact that it seemed like I was eating a big dish of spaghetti and fettuccine noodles, but half of it was squash! The zucchini/squash ‘noodles’ even tasted like pasta, especially when mixed with some pasta. It’s also very tasty with an oil based sauce if you prefer that to red sauce. Just as you would toss pasta in olive oil and garlic, add in zucchini spaghetti to stretch the servings, increase your vegetable servings, and have a healthier pasta dish. I love spinach fettuccine, but I bet it would be just as good with gluten free or whole wheat pasta. And of course, you can add any vegetable you like. I wonder how it would taste with sweet potatoes? Maybe that will be next! Check out the GEFU Spiral slicer here. It’s so much fun, easy to use, and makes for much healthier pasta dinners! Heat sauce, adding one can of diced tomatoes. Cook pasta of your choice as directed on package. 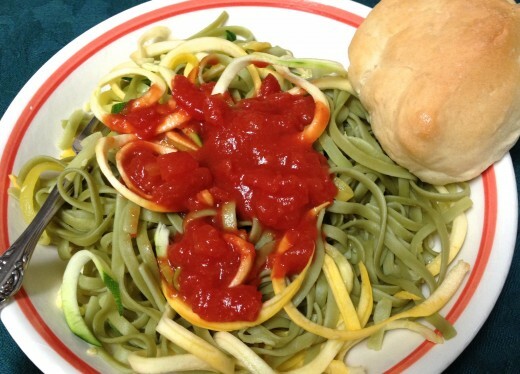 Spinach fettuccine is a colorful choice. Using a spiral slicer, slice the zucchini and yellow squash. Add zucchini/squash spirals to the cooking pasta for the last 1 to 2 minutes. It should be firm still. Drain and put in large serving bowl or individual bowls. Toss with sauce or serve separately. This is my favorite new gadget! It is so much fun! So easy to use to make long, long spirals just like spaghetti. A snap to clean too, with no disassembly needed. Small and easy to store. This worked easily on squash, carrots, even a russet potato! I LOVE it! Zucchini and crookneck squash are probably my two favorites so far to fix with the spiral slicer. It surprised me how well they blended with pasta, acquiring the same taste with sauce. And you can still slurp them if you want, just like in The Lady and The Tramp. That always makes it more fun for kids. It also works great for carrots. They look so pretty you can sprinkle them as a garnish on any dish, or in a salad. Cucumbers too–what a clever way to present a cucumber salad! Potatoes were great fun too. Instead of hash browns, make little potato nests. I spiral sliced one potato, sprayed the little spirals with olive oil, then baked them until they were crispy. Use parchment paper too, so when they are done you can simple wipe the pan off and put it away. No grease to deal with, no frying, though I’m sure they would fry up beautifully too. Next I want to try eggplant. That should be a natural for the spiral slicer. Try one. It definitely makes cooking vegetables an adventure.